Aubergine that has NOT been cooked properly is NOT nice! The texture of properly cooked aubergine should be soft and melt in your mouth; uncooked aubergine will remain hard and slightly chewy and not at all tasty, verging on bitter. 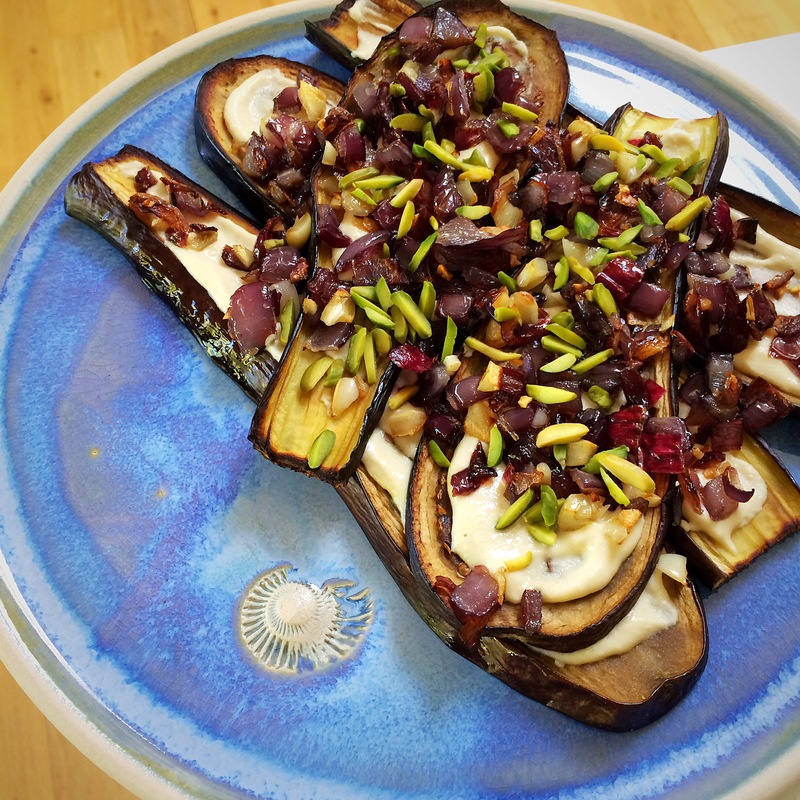 The trick is to ensure that you allow enough time to really cook aubergine well. Aubergine cooked on a barbecue is often one of the worst culprits as far as I’m concerned, I’ve seen chunks of aubergine threaded onto skewers alongside peppers and onions, and it’s never cooked well. The peppers and onions take so much less time to cook, that the poor aubergine doesn’t get a chance to catch up. My advice: cook them separately!! 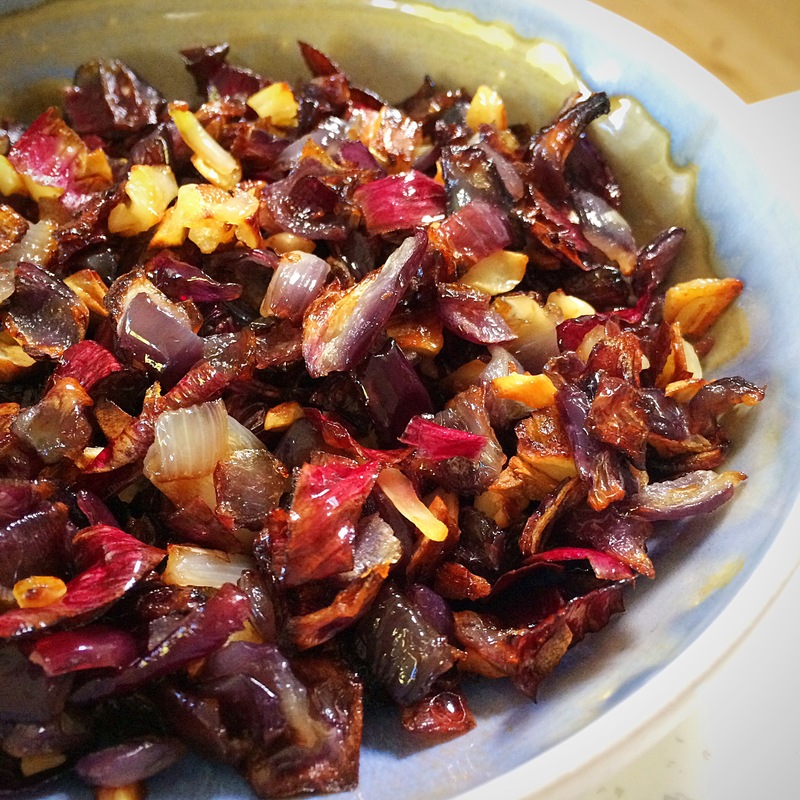 These aubergine chunks were marinated and roasted until lovely and soft, before being added to the sauce. 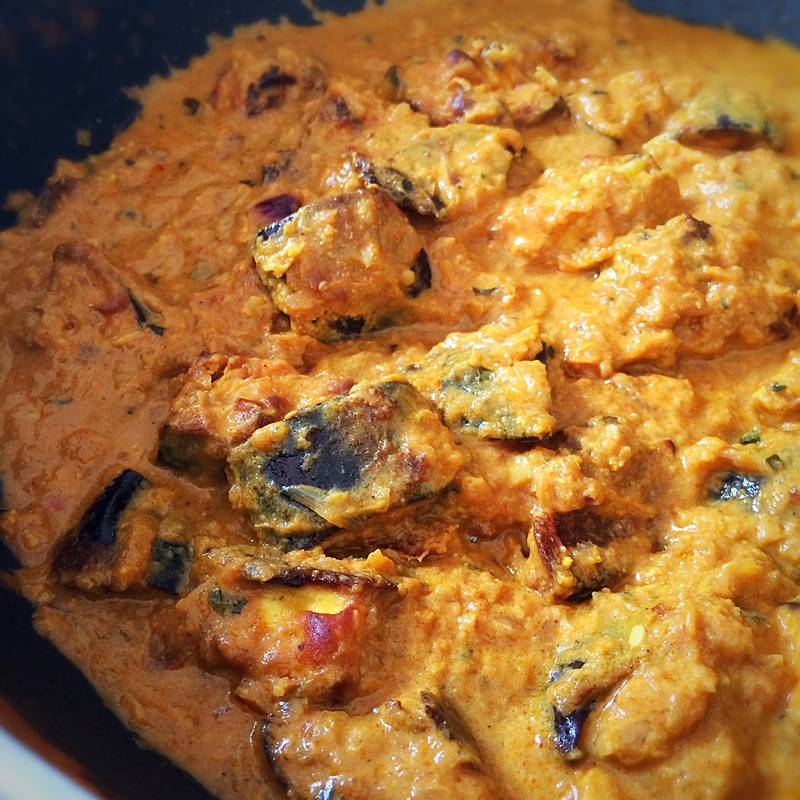 So my message is: please be sure to cook your aubergine well, and to this end, today I am sharing with you my current favourite way of preparing aubergine. 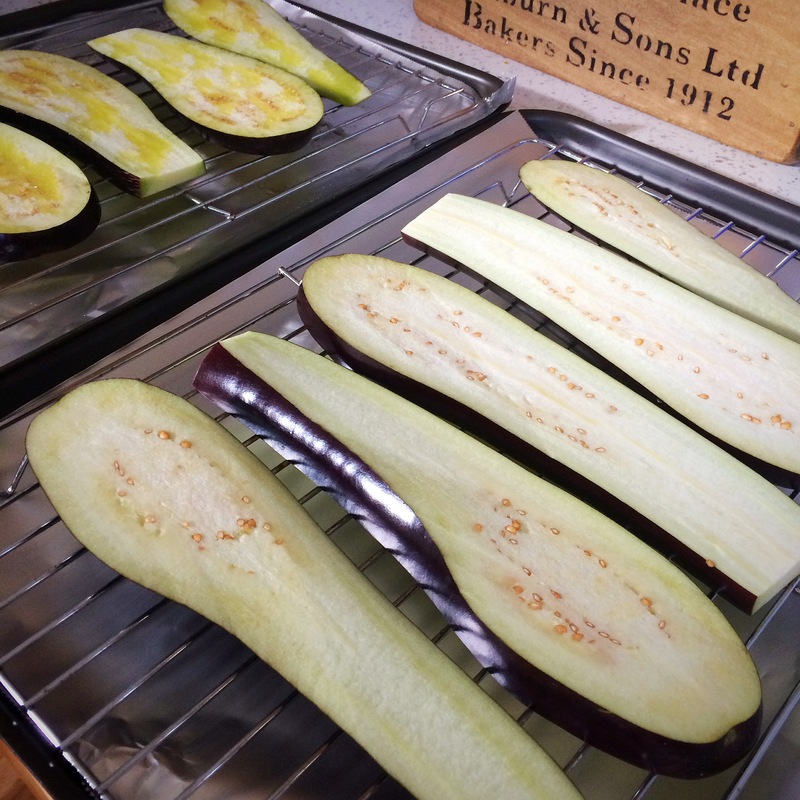 This is how I produced these lovely aubergine slices below.. There is an assumption that to really cook aubergine well, you need lots of oil. 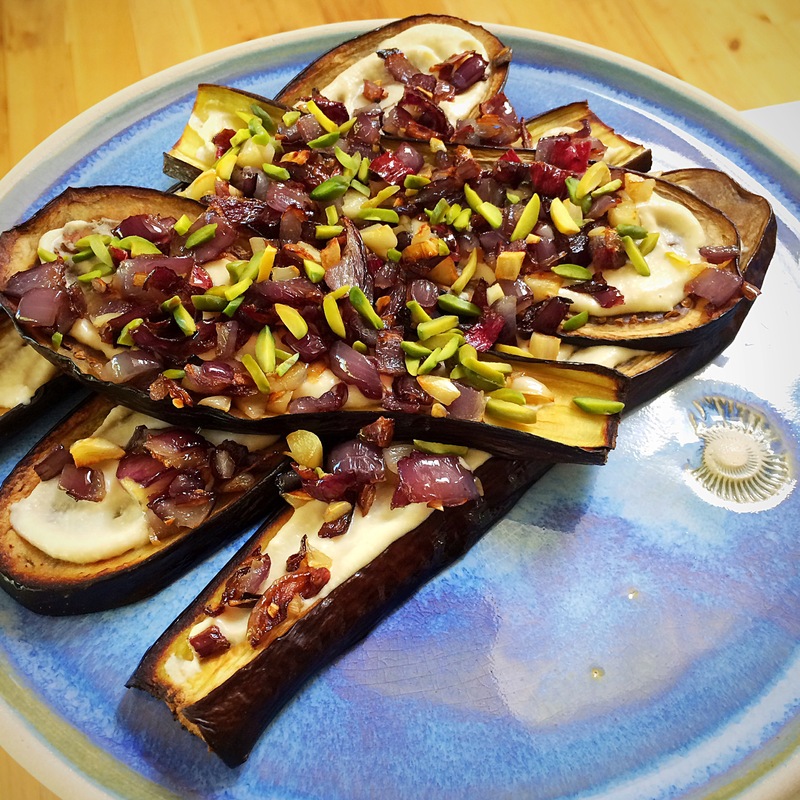 Aubergine is like a sponge and really soaks up oil, so if you do cook aubergine slices or chunks in lots of oil, it will merely hold onto it and fill your mouth with oil when you bite into it – yuk! 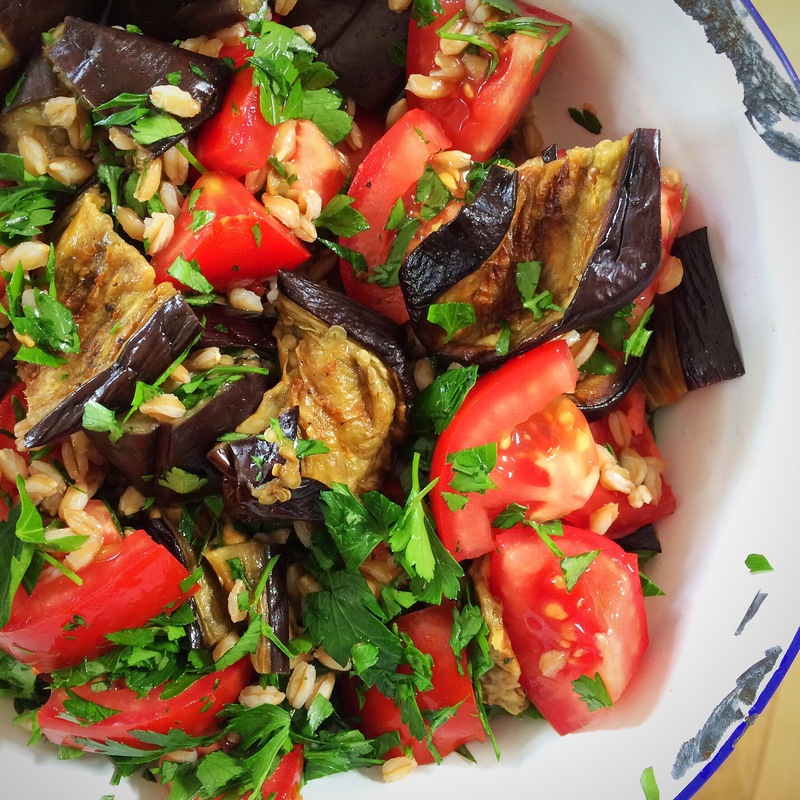 Use of some oil is good for cooking aubergine, it just doesn’t have to be drowning in it. 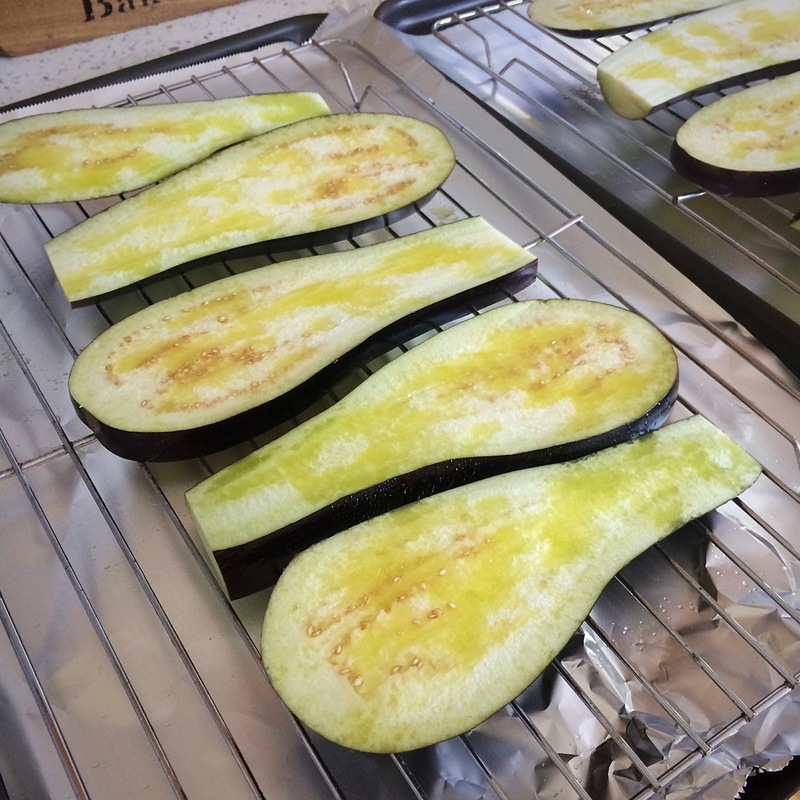 I usually use an olive oil spray when roasting or baking aubergine to control the amount I use. 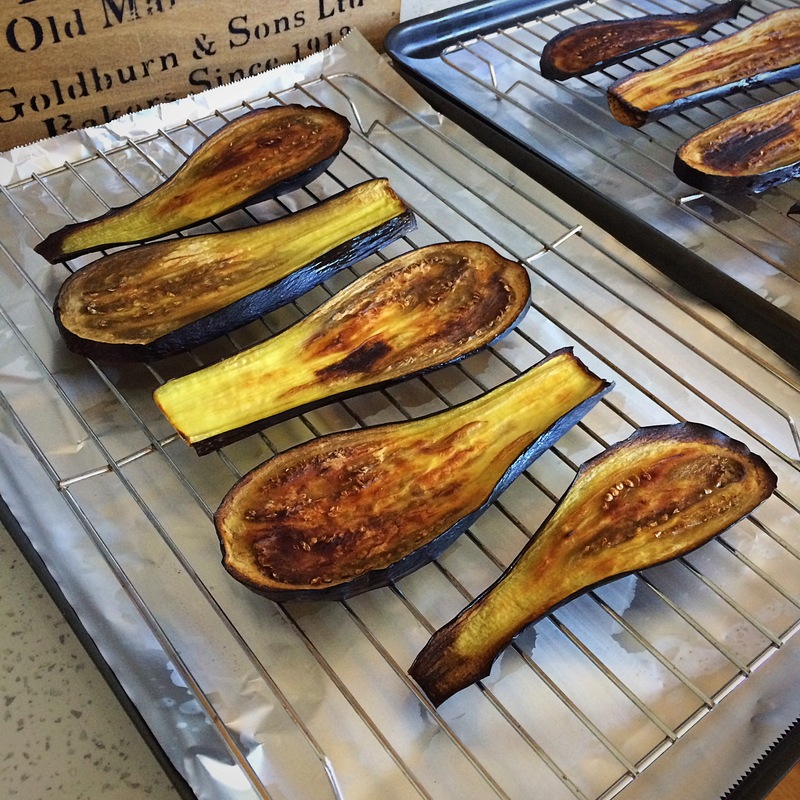 For these slices, I cut the aubergines into slices between 0.5cm and 1cm thick. If you slice them too thin, they risk burning and becoming papery. I cooked these in the oven, heated to 200c, until they looked like this.. They remain uncoloured on the underneath, but that doesn’t take anything away from the finished effect. On the rare occasion that I haven’t eaten the whole lot straight out of the oven, I’ve used these slices chopped up in salads..
Or to scoop up salad..
Or to create a plate of layered loveliness.. These slices have been spread with homous, then topped with beautiful roasted red onion and garlic and topped with toasted nuts. I’m also going to take this post along to Corina’s Cook Once, Eat Twice party, and add it to my own Pimp Your Veg collection. This entry was posted in Aubergine, Dinner, Healthy, Lunch, Mezze, Middle Eastern, Roasted Vegetables, Vegan, Vegetarian and tagged cooking, recipes on October 7, 2016 by Elaine @ foodbod. 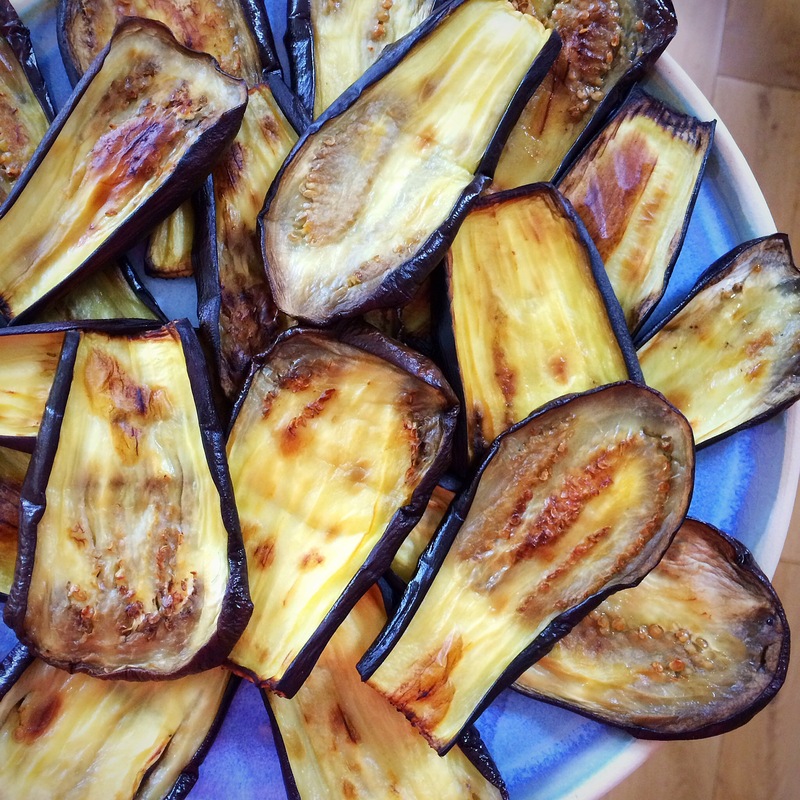 Love aubergines, preferably baked into black and then the insides scraped out and mixed with garlic spices etc. Yum! Oh yes!!!! Nice! Do you add a bit of tahini?? That sounds like such a typical story, what a shame! But you are absolutely right, it needs to be cooked completely – that’s why I played with sous vide, but that method is not working the way websites told me it would. I rather use your traditional way of baking it – winner! 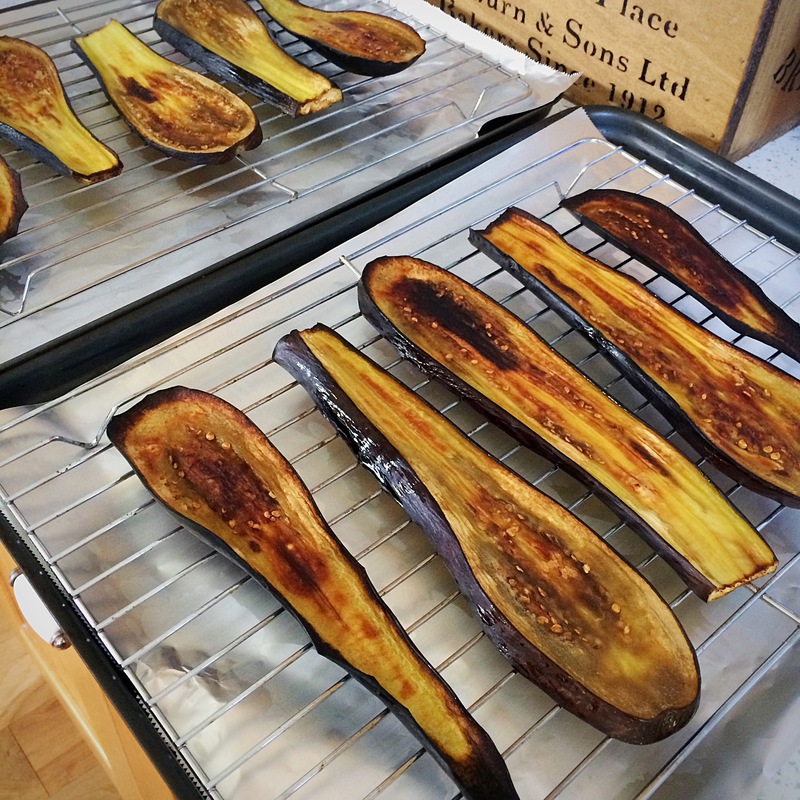 There’s so many great ways that you can roast aubergines whole and scrape out the flesh, maybe that’s the best way for you? My biggest bugbear is when restaurants serve poorly cooked veg!!!! Oh yum! These variations look amazing. I LOVE eggplant!! I don’t eat eggplant often but when I do, I like it to be cooked properly. Thanks for the tips! If I bake or roast eggplant, it’s only for myself, sadly. My husband is convinced that they are a nasty vegetable, and the peel is bitter. Oh well. I enjoy them, and your slices are beautiful! Oh really? What a shame! But then, I’m the only person in my house who eats them! Elaine, this post is about us. I wish I could say I love eggplant. aubergine, but I think I’ve only had poorly cooked aubergine so didn’t give it a proper chance. I’ll pin this one and see if I can change our thinking on this beautiful vegetable. You are a woman after my own heart! 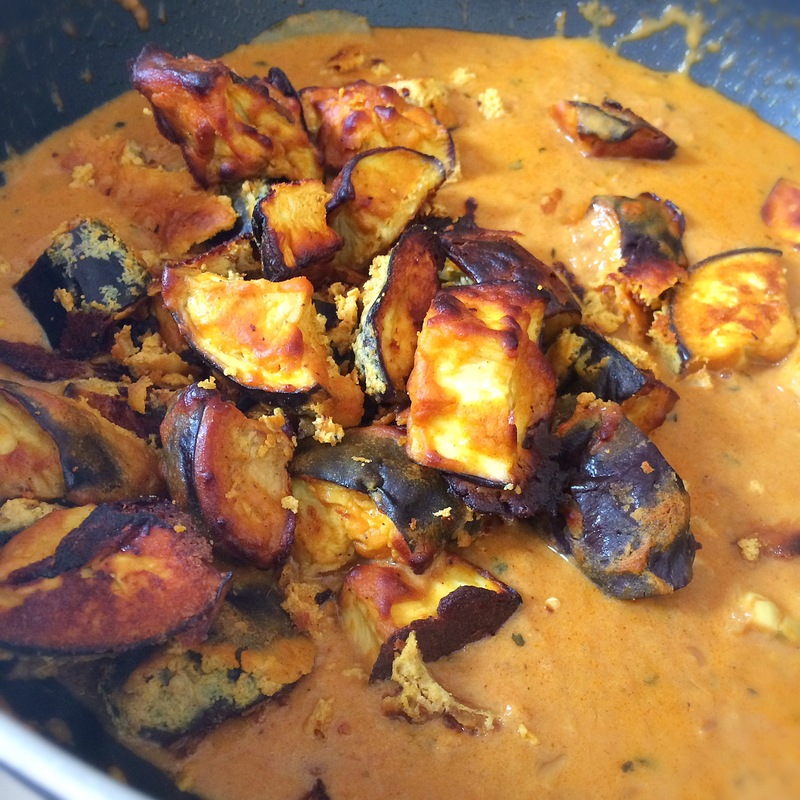 Is there much worse than improperly cooked aubergine? (Let’s pretend that current events aren’t happening!) I am so with you re. the disappointment at finding less than perfect aubergine ninja-ing in what would otherwise be a perfect dish. I love your ammonite plate, by the way – it’s beautiful! Thank you Nicole, we definitely share the same views on aubergines!!! Amazing dish. 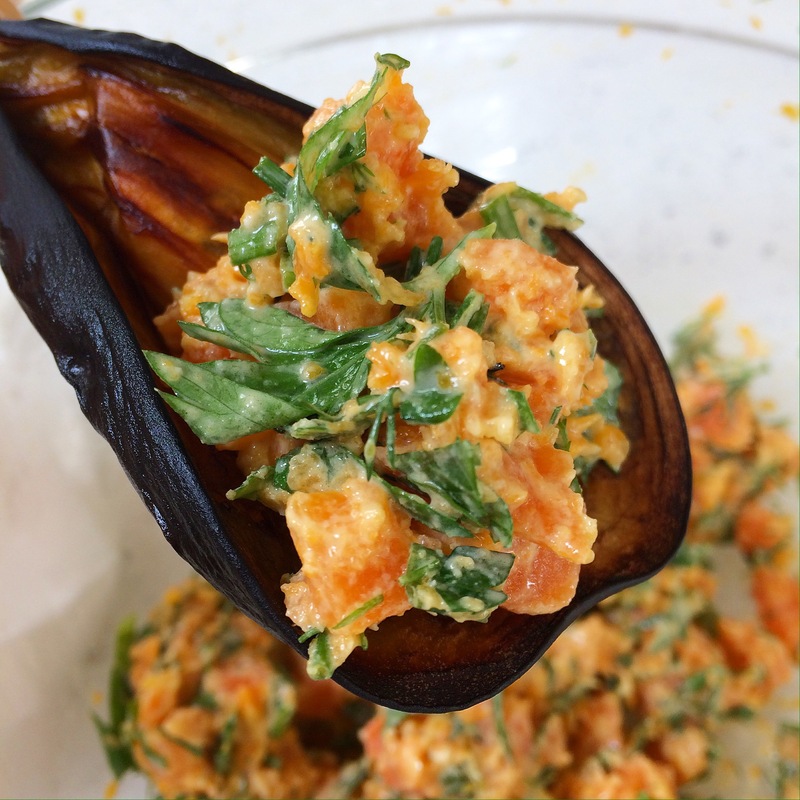 I love eggplant and will defintely make this! You have an amazing blog! I love reading your posts Elaine! As you know by now, I love aubergine & your dish looks so superb & appetizing too! Aubergine is my favorite vegetable! Love it! SPRAYING with oil. Revolutionary! I’m off to try cooking these this week!! Thank you!! My pleasure, I hope you enjoy them! This is such a useful post, I wish I’d discovered it years ago. I’ve only recently learnt to enjoy aubergines having been put off when I was young by a particularly disgusting moussaka. I’m now desperate to make that curry – it sounds wonderful.